As a trauma survivor, I tend to avoid myself like the plague. Feelings are, more often than not, something to flee. This post helps me to want to embrace them so I can continue healing. It is hard to find people in this world who will try to understand just what PTSD is, let alone how it impacts your life. Even people who love you are apt to know more about the president’s dog than PTSD. Even if they read up on it, they may not understand it in an empathetic way since it is not something they experience. There are days that I feel more understood by the cat than a dear friend. (Of course, this is anthropomorphism — but heh, whatever gets me through the day… 😉 ) But, here at WordPress, I can find others who walk my path — who “get it” — because they are walking it too. It may not be PTSD, but instead depression, anxiety, OCD, DID, bi-polar disorder, or any number of mental and emotional health challenges. But, we can understand each other because we have shared experiences. Some days, we write a post and feel heard when we see a “like” on it. We press “like” when we find a post we can relate to. Sometimes we even comment on each others blogs and share a thought or two. 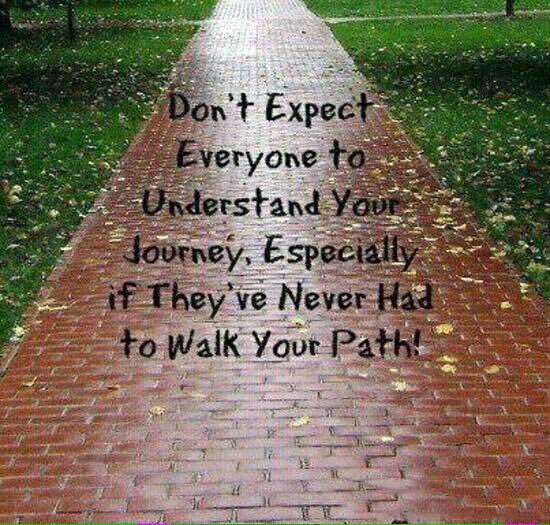 We see others on the path sharing our journey. The loneliness abates. Other people’s ignorance is easier to bear. There are others who understand and whom we understand and this is a very good thing.